This is a pleasant historic walkway in the centre of Eketahuna, which may be used to stretch your legs if driving through. The walkway was opened in 1911 to commemorate the Coronation of King George V and Queen Mary. It is a wide track and could be cycled most of the length, from Bridge St to Stout St. About 1/3rd of the way there is a sign point to a swimming pool down by the river. 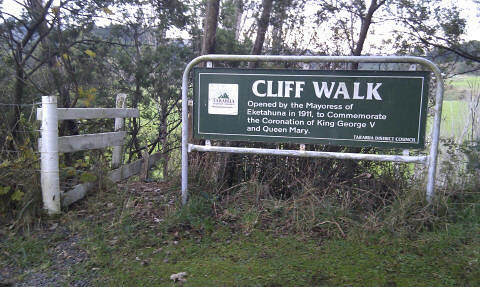 Although it is a cliff walk and is well above the river the track is safely fenced and is suitable for all ages. From SH2 which is Main Street through the middle of Eketahua, going north turn left on to Bridge St. Cross the bridge which is about 300 metres from the turnoff and the Cliff walk begins immediately after the bridge going south.